On December 20, 2011, Administrative Law Judge Theodore Essex announced his initial determination on Microsoft's ITC complaint against Motorola Mobility, finding the defendant's Android devices in infringement of four claims of a Microsoft patent. Until the ALJ published the redacted version of his detailed ruling (233 pages long) late yesterday, it was unknown how he arrived at this conclusion and why he didn't find a violation in connection with six other patents asserted by Microsoft at that stage. I already got the feeling that Motorola wasn't comfortable with the defensibility of large parts of the decision when I saw that its lawyers opposed an extension of time for Microsoft to file a petition for review. Denying an extension during the Holiday Season, when pretty much everyone (even bitter rivals like Apple and Samsung, and, respectively, Apple and HTC) can agree on such extensions, is very unusual. Lawyers typically treat each other as colleagues, and try to be reasonably helpful and cooperative. I updated the related post today after I saw that the ITC granted Microsoft an extension by two business days (short of the five days that had been requested). Having read the ALJ's initial determination, I'm convinced that this one will get a rough ride at the review stage or in the event of a subsequent appeal to the Federal Circuit. I obviously haven't been able to analyze all of the technical detail discussed in the initial determination, but that's not even necessary to see that the document has obvious shortcomings and even contradictions. Parts of it look like an overworked ALJ mostly wanted to penalize Microsoft for having declined his invitation to narrow the case to a greater extent than it did when it dropped two of the original nine patents. It's anything but well-reasoned. Key parts of the decision are just based on Microsoft not having gone into enough detail on claims that Motorola didn't even contest in the first place. The ALJ disliked the style of one or more of Microsoft's witnesses, but even in a context in which a Motorola fact witness apparently confirmed what Microsoft claimed, he didn't want to attach much weight to that fact. The thing is not even well-written, and there are more typos than I've ever seen in a document of this kind. It's absolutely nothing for the ITC as an institution to be proud of in any way, and it lacks all of the characteristics of documents that hold out well when they are reviewed or appealed. This is just my personal opinion. I haven't had the chance to discuss this document with anyone else, but I analyze so many documents of this kind that I'm confident that others will agree. I'll summarize the key findings and then I'll give some examples of the aforementioned striking deficiencies. The Commission has personal jurisdiction over the parties, and subject-matter jurisdiction over the accused products. The importation or sale requirement of section 337 is satisfied. The accused products do not literally infringe the asserted claims of the '054 Patent, the '352 Patent, the '133 patent, the '910 Patent, the '376 Patent and the '762 Patent. The accused products do literally infringe the asserted claims of the '566 Patent. Respondents do not induce infringement of any of the asserted claims of the asserted patents. The asserted claims of the '054 Patent, the '566 Patent, the '352 Patent, the '133 Patent, the '910 Patent, the '762 Patent, and the[space missing, one of countless typos in the original text]'376 Patent are not invalid under 35 U.S.C. § 102 for anticipation. The asserted claims of the '054 Patent and the '566 Patent are not invalid under 35 U.S.C. § 103 for obviousness. The asserted claims of the '352 Patent and the '910 Patent are invalid under 35 U.S.C. § 103 for obviousness. The '352 Patent is not invalid for failing to meet the best mode requirement. The domestic industry requirement for the '566 Patent, the '133 Patent, and the '910 Patent has been satisfied. It has been established that a violation exists of section 337 for the '566 Patent. It has not been established that a violation exists of section 337 for the '054 Patent, the '352 Patent, the '133 patent, the '910 Patent, the '376 Patent and the '762 Patent. I've produced a table that shows the different findings for each patent. In order for a violation of the law governing the ITC to be found, a patent must not only be valid and infringed but there must also be a domestic industry for it. Quite frequently (also in a couple of instances in this investigation), the infringement question and the technical prong of the domestic industry requirement are equally affected by the construction of key terms in the patent claims. It's important to consider that a number of the above findings are based on the ALJ's disappointment over Microsoft having allegedly failed to elaborate in its briefs on questions that Motorola didn't even contest. In other words, some of those "findings" are due to whatever may or may not have gone wrong at the pleading stage, regardless of the actual merits underlying the related issues. I mentioned that before and will discuss it again further below, but I wanted to highlight it here as well since the above table does not at all serve as an indication of what a court of law might conclude. Microsoft asserted the same patents in a district court, and unless the dispute between Microsoft and Motorola is settled before, there will be a federal court ruling on these claims -- and the outcome could be a rather different one. I'll go into more detail on some of the underlying issues as this process continues. It's pretty certain that there will be a Commission review, and there will be opportunities to go into more detail, possibly also on some of the technical issues. At this stage I just want to give examples of the shortcomings I identified, and which are so striking that I believe this preliminary decision will probably be modified or overturned. I highlighted two typos in the 13 conclusions of law further above. The number of typos in that initial determination is really unusual. But not only their number, also their nature in some cases. For example, I found at least two instances in which "then" appeared instead of "than" (footnotes 26 and 39). I also saw various instances of singular-plural mismatch. Furthermore, there are missing or redundant words. Further above I gave an example of inconsistent punctuation. Another example of an inconsistency that is highly unusual in a legal document is that the names "Motorola" and "MMI" (Motorola Mobility's stock ticker symbol) are used in confusing ways, such as this one: "MMI does not address the '352 technical prong in its brief. [...] As with its infringement for the '352 Patent, regardless of Motorola's lack of response, Microsoft must still show [...]" It would make sense to distinguish between Motorola (the name of the company when the investigation started), Motorola Solutions (an entity that was dismissed from the investigation), and Motorola Mobility. But in the sentence I just quoted as well as in numerous other instances, Motorola and MMI are used as synonyms. In a magazine article or blog post, one might want to use two names interchangeably for the sake of variation. But in a proper legal document, the primary objective is to have clear and unambiguous references. I believe that those reviewing the initial determination, or evaluating it at the stage of an appeal, will have doubts about whether the evidence, including testimony, was weighed the way it should be. "The ALJ finds that Dr. Stevenson's cryptic testimony and his evasive manner at hearing, which the ALJ found to be less then [sic] credible, leads the ALJ to give no weight to Dr. Stevenson's testimony on this point. As such, the ALJ finds this argument, which is based on his testimony, to be meritless." That passage speaks for itself, but in case you didn't notice, the combination of "[t]he ALJ finds that" with "leads the ALJ to" doesn't make much sense. In the infringement analysis concerning the '054 patent, the judge dismisses Microsoft's argument as "incoherent" and its key witness as "unreliable", but what's really amazing is that he doesn't even give much weight, if any at all, to the fact that a Motorola witness apparently confirmed something that Microsoft claimed. The ALJ argues that the relevant witness was just a fact witness, not an expert witness. In other words, Microsoft's witness is unreliable, and Motorola's witness is incompetent as soon as he agrees with Microsoft. This simply doesn't reflect favorably on the initial determination as a whole. "This is, quite simply, nothing more than an improper attempt to circumvent the page limitations set by the ALJ for post-hearing briefs." "While the ALJ may have been able to glean the meaning of the term 'manipulate' by culling through the record to find out exactly what Microsoft meant, this is no different from incorporating arguments by reference or simply citing testimony with no explanation. The ALJ declines to engage in such an exercise since it would eviscerate the need for any post-hearing briefing if the ALJ were required to 'figure out' the parties' argument from the record." There are strict page limits in ITC proceedings. In an investigation in which a large number of patents are asserted, this limits the space available to the parties to discuss each patent. The ALJ clearly would have preferred Microsoft to narrow the case to a greater extent than dropping only two patents. I gathered that from the way he explained a six-week delay of this initial determination. It appears that this ALJ wants to show to Microsoft and everyone else that asserting many patents in parallel will backfire. The problem is that he bases significant parts of his decision on this instead of making substantive decisions. It remains to be seen whether the top level of the ITC is comfortable with this approach. It may not be. "The ALJ finds that Microsoft has failed to offer sufficient proof to meet the technical prong of the domestic industry requirement. [...] The ALJ notes that this is not a case of a fundamental unfairness in the law. Microsoft chose to rely on code for which it has no evidence [missing word] was ever implemented to meet its burden to prove the technical prong. This is not to stay that Microsoft was required to actually examine the source code of every device, but there must be some evidence presented as to how the device actually works." In several instances, the initial determination says that dependent patent claims are not infringed if the independent claims they depend on aren't. In other words, a dependent claim has its own limitations (criteria) but also incorporates all of the limitations of the independent claim it depends on, and infringement requires that all limitations -- including all incorporated ones -- are met. Each and every time that the ALJ makes that point, he cites a whole paragraph from a Federal Circuit decision. It would have been sufficient, and the more commonly adopted approach, to cite that decision only once -- where it comes up for the first time -- and to reference it briefly in all other instances. That's what other judges normally do. It's also what this same ALJ did in some other contexts (where he does make supra references). If he suspects parties of circumventing the page limit, this repetitious and redundant quoting of a whole, relatively long paragraph is not a textbook example to follow either. Some of this criticism may appear superficial. As I explained before, those are just indications -- some of them fairly strong ones -- of the initial determination being flawed in a variety of ways, and there will be some more discussion of substantive issues going forward, including technical stuff. This investigation curently has a target date of April 20, 2012. Android the "epitome of hardware dependent software"?! "Instead, the Android architecture, with its [REDACTED], is almost the epitome of hardware dependent software." So he calls an operating system that runs on devices from several dozen manufacturers, and on a diversity of form factors, "almost the epitome of hardware dependent software". We'll see how this matter evolves. Expect a thorough review. With a number of judicial decisions involving Android scheduled for next year, the debate over public interest factors relating to injunctions and import bans is not going to stop anytime soon. The latest contribution to it comes from International Trade Commissioner Dean A. Pinkert. At the top of the ITc, there's a six-member decision-making body briefly called "the Commission". It consists of six commissioners. One of them is chairman, another one is vice chair, and Mr. Pinkert is one of the other four members. Yesterday, Mr. Pinkert filed a public version of his "additional views [...] on remedy and the public interest" in connection with the technically narrow exclusion order against HTC's Android products that the ITC handed on December 19, 2011. The commissioner's four-page statement starts off stating that he concurs with his colleagues "regarding the remedy that is appropriate in this case", but he wrote separately in order to document inhowfar he differs from his colleagues' reasoning with respect to public interest factors. In his summary, he reiterates that he just "wish[es] to emphasize that the existence of substitutes for the infringing devices does not obviate consideration of the likely impact of exclusion on the range of choice available to consumers in the smartphone marketplace" and notes that "[s]uch impact may warrant more searching inquiry in other investigations". Since the reasoning of the ITC's decision is not yet available (I believe a redacted version should enter the public record soon, but it hasn't yet), it's difficult to gather from the commissioner's brief statement which parts of the majority opinion he doesn't support. He agrees with Apple on a number of points and argues that the decision apparently gives HTC enough time for adjustments. I think that's an understatement. In a way, HTC's immediate announcement after the ruling that a workaround is in place and its claim that the feature is rarely used (discussed in this recent post) calls into question that the ITC's decision to delay the impact of its decision by four months (two of which would be available for the presidential review anyway) made sense. By the time the import ban against devices implementing one particular patented feature takes effect, more than two years (!) will have passed since Apple's original complaint. HTC had all the time it needed to prepare for this kind of ruling, and it's now clear that the ITC was overly generous with the transitional period it granted. In fact, the ITC was so generous, or lenient, in this case that this could be a case of an abuse of discretionary power. If Apple asked the Federal Circuit to review this particular aspect of the decision, HTC's own statements would prove that the ITC tolerated a proven case of patent infringement for a transitional period that was simply not needed. An appeal against the ruling may make sense for Apple with respect to the ITC's finding of no violation of a much broader patent-in-suit, but the delayed effect of the import ban may not appear worthwhile appealing from a practical point of view. I just wanted to point out that the ITC's related approach is more than debatable. In his "additional views", Commissioner Pinkert notes that some of HTC's public interest arguments were based on the competitive relevance of all Android handsets as opposed to only HTC's own products. I would agree with him that in any future decisions on Android-based devices, the availability of Android-based products from multiple vendors must be considered carefully. Footnote 2 of Commissioner Pinkert's statement notes a "non-exhaustive list of non-HTC 4G Android handsets offered for sale on carriers' websites and websits of their resellers on November 24, 2011". That list is pretty impressive and shows, in my view, that HTC grossly overstated the impact of an import ban against HTC on choice in the market. It's reasonable to argue, as Commissioner Pinkert does, that "the availability of substitutes does not necessarily mean the consumer's desire for quality and variety can be satisfied in the absence of the infringing devices", especially "in a rapidly changing, technologically driven, market like today's smartphone market". But valid questions aren't necessarily the most pertinent ones in a given case. In my view, the most important question that the decision on Apple's first complaint against HTC raises is the following one: are any delays of import bans, or denials of cease-and-desist orders, justifiable in cases in which the respondent(s) had plenty of time, counting from the filing of the complaint or possibly even earlier infringement notices, to remove features without which the products concerned can still be sold? If the ITC hands technically narrow rulings, as it did in this case, it's hard to see why it would be against the public interest to put an end to such infringement that can be easily avoided (and that could have been avoided for quite some time). The US International Trade Commission will continue to receive invitations from various stakeholders to turn itself into the US Infringement Toleration Commission. It will have to be vigilant, and it will indeed have to conduct "more searching inquiry" in this context. It's far more difficult to obtain documents related to Federal Circuit cases than to research litigation in the district courts, but at least I have an update on the procedural status. On December 13, 2011, Apple brought a motion to expedite the appeals process. Two more briefings (probably a reply by Samsung and another by Apple) and three days later, the CAFC granted Apple's motion. Accordingly, Apple had to file its opening brief on or before December 22, 2011; Samsung had until January 9, 2012 to file its opposition brief; and Apple had until January 16, 2012 for its reply brief and appendix. In that same order, the court noted that this case would be "scheduled on the March oral argument calendar if practicable". Apple filed an opening brief on December 22, but six days later it filed a notice of correction. But the court formally rejected both the original brief and the corrected brief yesterday (December 29) and set a new January 12, 2012 deadline for Apple's (second) corrected brief. I haven't seen a new scheduling order, but since the new deadline for Apple's opening brief is three days after the original deadline for Samsung's response to that one, there must be a delay of (presumably) two or three weeks. It's totally unclear why the CAFC ordered this do-over. I can just see that those filings occurred, and I can see headlines and sometimes summaries. But none of the publicly available information indicates what was wrong with Apple's first corrected brief. I'm sure the court instructed Apple, so the second corrected brief should be fine, in all likelihood. In principle, CAFC proceedings are public. For example, Apple filed both a confidential and a redacted non-confidential version of its brief with the court (which just doesn't share it with the public for the time being). In recent months I was quite lucky that different sources (sometimes anonymous ones and sometimes known ones that I protect) provided me with court orders and filings, some of which were good for Apple and some of which were not. I'm always grateful for any such information and encourage those directly or indirectly involved with this CAFC process (or with the CAFC process concerning the Lindholm email, a key piece of evidence in Oracle v. Google) to support my research by sharing relevant, non-confidential (but hard-to-obtain) documents with me. 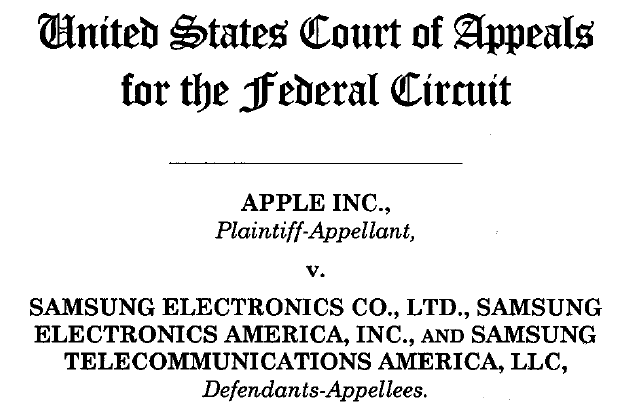 My opinion on Apple's CAFC appeal is the one I outlined in a previous post. In my view, Judge Lucy Koh of the United States District Court for the Northern District of California did a great job narrowing the scope of protection of Apple's design patents. It appears that the German courts are now also starting to think along those lines. At the same time, I was not at all impressed with Judge Koh's analysis of the harm the parties would suffer from an injunction or continued infringement. I think it's likely that the CAFC will overrule some of her related reasoning because it would set the bar for injunctive relief in this kind of industry far too high, almost impossibly high. Her analysis of the equitable factors also showed a lack of understanding of the relevant markets and their dynamics. 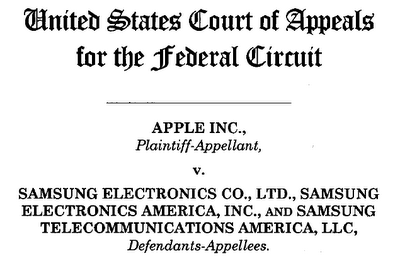 This CAFC process could have major impact not only on Apple v. Samsung but on the industry at large. I'll keep following it to the extent that I have access to information. On November 21, 2011, the ITC dismissed S3 Graphics' first complaint against Apple in its entirety, following a Commission review of an initial determination by an Administrative Law Judge (ALJ) who found some of Apple's Macintosh computers to infringe two of S3G's four patents-in-suit. Both parties disagreed with the ALJ: Apple wanted (and ultimately won) a dismissal while S3G, which is in the process of being acquired by HTC, wanted more leverage than the ALJ's initial determination, if affirmed, would have provided. At the time of the ruling, the reasoning wasn't publicly known. The result, "no violation", could have had any number of reasons. More than a month later (on December 22, 2011), the ITC published a redacted version of its detailed (72-page) decision. I analyzed it in order to provide this summary. The ITC investigation is over, but the ruling is nevertheless worth looking into. Even though Apple doesn't have to fear an ITC import ban over those patents anytime soon, the dispute between Apple and S3G isn't over. S3G might appeal the ITC's decision to the Federal Circuit, and the same patents are at issue in a federal lawsuit (in the Northern District of California) that is currently suspended for the duration of reexaminations of those patents by the USPTO (including all possible appeals of any non-final reexamination result). And beyond this particular dispute, the ITC seized this opportunity to provide some further clarification on the boundaries of its mandate in connection with products that are imported in a non-infringing form but used in infringing ways after they enter the United States. The related passages of that ruling will likely be cited in a number of future ITC investigations raising similar issues. In order to keep things focused, I won't go into detail on the many reasons for which the Commission, the six-member decision-making body at the top of the ITC, affirmed those parts of the ALJ's initial determination that worked out in Apple's favor anyway. Basically, the Commission provided some clarifications that are basically corrections of what it considered legal errors on the ALJ's part, but on the bottom line it reached the same conclusions as far as the ALJ decided against S3G. This includes that the Commission also believes Apple has an implied license to the extent is uses NVIDIA chips, and like the ALJ, the Commission found several reasons (any one of which would have been sufficient on its own) for seeing no infringement by the iPhone, iPad and iPod. I'll focus on why the Commission disagreed with the ALJ's position that some of Apple's Macintosh computers (depending on which graphics chips they contain) should have been banned due to the alleged infringement of claim 11 of the '987 patent and claims 4 and 16 of the '146 patent. As I expected all along, AMD's claims that it -- not S3G -- is the rightful owner of the patents-in-suit and its demand that the investigation should therefore be terminated did not win the day. The Commission concluded that AMD's motion for an intervention was untimely and unnecessary since Apple was perfectly capable of representing AMD's interests in this respect. Those considerations outweighed the fact that AMD brought claims that, if proven, would have constituted a legitimate interest in the outcome of this matter. Besides AMD asking for the right to intervene, both AMD and Apple asked the ITC to terminate the investigation or to remand it to the ALJ for further examination (and delay). But the Commission determined that "S3G holds title to the asserted patents" and that Apple and AMD "fail to prove by a preponderance of the evidence that AMD owns the patents in question". There's still some federal litigation going on over this matter, and we'll see if anything comes out of it. The ITC has seen all of the evidence and is unconvinced. The Commission overruled the ALJ with respect to the validity of claim 4 of the '146 patent. The Commission "agree[d] with Apple that the ALJ's findings with respect to anticipation of claim 4 appear to be the result of a mistake" and determined that the Hoffert prior art reference anticipated claim 4 or, alternatively, rendered it obvious. In this context, the Commission furthermore believes that S3G forfeited a seemingly important argument. But the Commission explains that the argument was wrong at any rate. If S3G appeals, it will face a dual hurdle with respect to the validity of this patent claim. It will have to prove the Commission wrong on the issue itself as well as on the question of whether S3G preserved its related record. As far as the other two patent claims the ALJ deemed valid and infringed (claim 11 of the '987 patent and claims 16 of the '146 patent) are concerned, the Commission concluded that the Macintosh computers imported by Apple don't infringe any of those two patent claims at the time of importation. For example, one of those patent claims relates to a data format, and those computers don't contain any graphics stored in that format (or at least S3G didn't prove it) at the time of importation. Subsequently to importing those devices, Apple may infringe certain patent claims as an inevitable consequence of testing those devices, or sell apps that practice the relevant inventions. While those subsequent activities might be seen as a "nexus" between importation and infringement, the Commission clarified that Section 337 (the law governing the ITC's unfair import investigations) was amended in 1988 and clearly relates only to "articles that -- infringe" given U.S. patents. In this particular case, S3G didn't convince the ITC that Apple's products, in the form in which they are imported, indirectly infringe the asserted patent claims. Without direct infringement occuring somewhere, there can be no indirect infringement further up the supply chain, and S3G wasn't able to prove direct infringement. The ITC was inclined to believe that Apple may very well infringe those patent claims in the United States, but the ITC's mandate is limited to keeping infringing products out of the U.S. market. It's not a broadbased IP enforcement competency of the kind that the federal courts have. If Apple's testing or, worse than that, its sale of apps (which are not imported in the ITC's unsurprising opinion) through an online store could result in ITC import bans against its devices, that would have been a problematic precedent -- not only for Apple but also for many other device makers. The Commission has set the record straight on this. S3G went too far with its claims. But chances are that, sooner or later, someone else will also try to test or push the boundaries of the ITC's mandate. Concerning its mandate, the ITC disagreed not only with S3G but also with Apple, which asked the ITC to find that it has no jurisdiction over S3G's complaint. In other words, Apple wanted the ITC to determine that there should never have been an investigation in the first place. In its decision, the Commission stressed that "[it], like the ALJ, find[s] that Apple's argument conflates an analysis of the Commission's jurisdiction with an analysis of whether S3G has met its burden to prove a violation of section 337". In other words, the fact that an infringement pattern doesn't meet the legal requirements for an ITC import ban doesn't mean that a complaint shouldn't be investigated by the ITC until its failure to meet those criteria is established. The Commission said that S3G had pled claims that could have justified an import ban if only they had been accurate. Therefore, there was a need for an investigation, and in this particular case, it was necessary to reach the stage at which it became clear that there's no indirect infringement at the time of importation. The decision notes that this is a non-issue in most cases: "Although satisfaction of the importation requirement is seldom disputed in section 337 investigations, the present case is an exception." To the same effect, the Commission noted that "the current investigation presents an unusual circumstance in which a respondent's domestic infringement cannot support a violation of section 337". If S3G's patents aren't invalidated as a result of reexamination, it may have a case against Apple in the Northern District of California. But reexaminations and the related appeals will probably take some more time -- possibly years -- before we find out. Meanwhile, S3G has a second ITC case going against Apple. It's time for another fact check on the state of the Java-related patents Oracle is asserting against Google. Contrary to widespread misbelief, none of the six patents Oracle is still asserting (Oracle voluntarily dropped one of the original seven) has been invalidated on a truly final basis. By "trukly mean" I mean final-final, not just preliminarily final. Depending on when the case goes to trial, Google could still be ordered to stop infringing any or all of those six patents. And even if the court stayed the case pending the completion of all reexaminations (when I say "completion", I mean the end of the whole process, not just the conclusion of the first part), statistics suggest that Oracle would likely have multiple patents to assert in the end -- probably not all six, but three or four are a reasonably probable number. In two filings earlier this month, Oracle and Google updated the court on the status of the ongoing reexaminations. Three weeks ago, they summed up the state of affairs at that point, and last week, they reported that the USPTO had issued a "final Office action" (sort of "final", but not "final-final") concerning Oracle's '476 patent. Google has done a great job on, and made considerably headway with, those reexaminations. It has clearly demonstrated that most of Oracle's asserted patent claims are of disputable validity. I wouldn't be surprised if Oracle at some point determined that it needs to assert some more of its 2,000 or so Java-related patents in a second (separate) complaint, and it's possible that the copyright part of this litigation has gained importance in Oracle's strategy at the expense of its embattled patent claims. But again, not even one of those patents has been annulled so far. One patent (U.S. Patent No. 6,061,520) is considered patentable by the USPTO. This one will enjoy an enhanced presumption of validity at trial time. There's one patent (U.S. Patent No. RE38,104, naming short-time Google employee James Gosling as the inventor) on which the USPTO hasn't commented yet, not even in the form of a first Office action. It's impossible to conclude anything from that fact. In its own report to the court, Google claimed that "[n]one" of the claims of this patent is "[c]urrently [a]llowed", but that's grossly misleading. There's a rather strong presumption of validity of issued patents under U.S. law (which in my view shouldn't be the case because the USPTO issues to many bad patents, but that's the law as the Supreme Court decided this summer). That presumption of validity is not even affected by first Office actions, but the mere fact that reeamination is ongoing, without anything known about the examiner's inclination, is lightyears away from a patent being less than (for the time being) valid. For two patents (U.S. Patent No. 5,966,702 and U.S. Patent No. 6,910,205), there have been first Office actions rejecting all of the relevant claims, but no final Office actions yet. For two other patents with respect to which there have been first Office actions (U.S. Patent No. 6,192,476 and U.S. Patent No. 7,426,720), the initial rejections have been confirmed by "final Office actions". However, if the USPTO says that it "closes prosecution", this just means that the examiner's work is done for the time being (it could be resumed later as a result of a decision to remand). It doesn't mean that the patent has actually been invalidated: Oracle can, and most likely will, appeal this decision to another department of the USPTO, the Board of Patent Appeals and Interferences (BPAI). I have seen different recent statistics about the outcome of BPAI appeals in such reexamination proceedings. Rejections by reexaminers are affirmed in a majority of cases, but they are reversed in their entirety in about a third of all cases and sometimes reversed in part, or remanded. Even the BPAI's decisions are appealable (to the Federal Circuit). Let's assume, for the sake of the argument, that the Gosling patent also stands up pretty well. Then Oracle would have two valid patents and a good chance of reversing the decision, at least with respect to some of the asserted claims, with respect to some claims from one or two of the other four patents. Oracle's argument for a near-term trial comes down to "justice delayed is justice denied". Google's argument is obviously that it shouldn't be held liable for infringement of patents of uncertain validity. This is a high-profile litigation, and it certainly doesn't reflect well on the USPTO. It appears that it's rather easy to get a patent granted initially, but it also seems that the USPTO's central reexamination unit may make it too easy for those contesting the validity of an issued patent. One may wonder how much independent analysis is actually performed. In a very recent filing, Oracle cited several cases in which courts determined that even "final" Office actions are prejudicial to a patent holder if shown to a jury in an infringement case while an appeal is ongoing. We will see what Judge Alsup decides. He can always tell Oracle that resource constraints force the court to stay the case unless Oracle narrows it to a very short list of patent claims, but as I explained on previous occasions, it would be very risky for Oracle to narrow its case too much. I'm sure Oracle expected serious reexamination pressure when it started this litigation. You can't sue an organization the size of Google without significant blowback, and Google isn't just large and deep-pocketed but also very smart. Oracle didn't asserted seven patents because it thought it would prevail on all seven, but to maximize its chances of prevailing on some of them. At the same time it's possible that Oracle's decision-makers were much more confident of the strength of their patents when they started this than they are now when they look at the status of the ongoing reexaminations. Throughout the industry, it's possible that the value of these kinds of patents has been overrated. The difference between patents that have been issued but never tested and patents that have withstood massive challenges becomes clearer every day. Given that so many issued patents are of questionable validity, plaintiffs will actually have to assert many more, not fewer, patents going forward. Companies that thought they sufficiently hedged their bets by asserting five or six patents may now find that even if they asserted ten patents, they might be lucky to succeed with only one of them. If they have many patents that read, at least potentially, on an accused technology, they might sue over 12 or 15 (or even more) patents right from the start and then narrow the case along the way, at a point in time when they know what invalidity contentions a defendant has presented. Even during this week, the slowest and calmest one of the year, some judges and lawyers are working on a number of smartphone patent cases. For example, there have been some filings and orders in Oracle v. Google this week. But for the most part, the Holiday Season is also a vacation season and people are spending time with their families. On Thursday, the Chairman of the ITC granted Apple and HTC their motion to extend the due dates for responding to the Commission's December 16, 2011 notice of review. In light of the Holiday Season, Apple's and HTC's lawyers agreed that an extension made sense. On Tuesday, an Adminstrative Law Judge (ALJ) granted an extension to CVE Technology Group, a non-party subpoenaed in the ITC investigation of Samsung's complaint against Apple. Neither party opposed this request. Also on Tuesday, that same ALJ granted an extension to several consultants to HTC who were subpoenaed by Apple in the investigation of Apple's second ITC complaint against HTC. Again, no one opposed. All of the extensions mentioned above were requested with reference to the special circumstances of the Holiday Season. All of them were noncontroversial despite the fact that Apple's disputes with HTC and Samsung are bitterly-contested patent wars in which time is of the essence. All of these requests were readily granted by the ITC. I copied that paragraph from a document Microsoft filed yesterday to ask the ITC for an extension by only five business days for filing a petition for review of last week's initial determination finding Motorola in infringement of one of seven Microsoft patents-in-suit. The motion explains that "Microsoft's outside and in-house legal team are largely unavailable at various times during the short period between service of the Initial Determination and the current due date for any petitions for review" and mentions the "intervening Christmas, Hanukkah and New Years holidays". Despite those circumstances, Microsoft wants to have enough time "to adequately digest the many legal and factual findings made by the ALJ and to determine which of these issues should be included in Microsoft's petition". Motorola's opposition to this request is unusual because lawyers normally treat each other as colleagues even if they represent adversaries. There's a certain, unwritten, code of ethics according to which they fight each other on the issues and will use aggressive rhetoric to the extent that it's necessary, but when it comes to case management matters like this one, they try to be helpful, or at least somewhat cooperative. By opposing such a request for an extension, Motorola's lawyers disregard their colleagues and, above all, their families. I have had brief conversations with high-ranking Motorola in-house lawyers before and after some of the recent hearings in German courts. Everyone realizes that the stakes are high in these disputes, but these are definitely not the kind of people I would suspect of disrespecting their colleagues. After all, this here could take years to be resolved, and next time they might be the ones asking for an extension at this time of the year. The only explanation I have for this is that someone at the highest level of the organization ordered Motorola's legal team to do anything it takes, no matter how inappropriate, to prevent Microsoft from seeking a review of the preliminary ITC ruling. Since Microsoft has seven patents in play, such a review could result in Motorola being found to infringe more than the one patent the ALJ deemed infringed. And even if the Commission, the six-member body at the top of the ITC, didn't overrule the ALJ to that effect, any issues raised at this stage could be appealed to the Federal Circuit. For the ITC as an institution, it wouldn't look good at all if the Court of Appeals for the Federal Circuit (CAFC) identified clear errors in the ITC's reasoning in a way that would run counter to the ITC's mandate. Therefore, should Microsoft have strong legal arguments for a modification of the ALJ's recommendation in its favor, things could get worse for Motorola than they appear right now. Against that background, I totally understand that Motorola doesn't want Microsoft to have too much time to raise legal issues at this stage. But an affront like this suggests that Motorola isn't comfortable that the ALJ's reasoning is solid enough to withstand serious scrutiny. I haven't seen the detailed version of the ALJ's initial determination yet. It always takes time before any redacted version enters the public record. I don't even know which of these patents were deemed invalid and which ones not to be infringed, or what role any other defenses may have played (I saw that Motorola at some point brought a motion raising an estoppel-like defense). When the initial determination becomes available, I will certainly take a close look and blog about it. But before I have seen it, I can already see that Motorola is so apprehensive of a possible review (or further appeal) that it has chosen to violate an unwritten code of professional ethics. "The result: a series of small, but significant limitations on the functions of Android phones." "HTC has said it will comply with the ruling by eliminating the feature from its phones. But a Google official, speaking on background, said his company has no immediate plans to drop the feature from its Android software." To be fair, Google didn't rule out removing the feature further down the road. It just said that it had "no immediate plans". Maybe Google is going to remove it as soon as it's clear that HTC won't appeal the ITC decision to the Court of Appeals Federal Circuit, or in case there is an appeal but the CAFC doesn't stay the import ban. It could take a couple of months to find out. By downplaying the importance of the data tapping feature as "actually quite rarely used", HTC has greatly reduced the likelihood of a stay. To argue successfully for a stay, HTC would want to stress irreparable harm. Be that as it may, I give Google the benefit of the doubt that the ITC import ban may be stayed before it even starts to take effect. That said, with more and more Android-related patent rulings coming in and coming up all the time (usually against device makers), it's time that Google clarified -- to its device makers, to the Android developer and user community, to the world of finance, and to the general public -- its policy relating to features that a court (or quasi-judicial agency) of competent jurisdiction holds to infringe a valid, enforceable patent. as a matter of good citizenship (also known as "corporate social responsibility") respect the law and the institutions tasked with interpreting and enforcing it. You know, "don't be evil". There is certainly an international dimension here. A patent can always be enforced with respect to only one jurisdiction at a time. If a court in the Netherlands orders Samsung to modify its photo gallery (as it happened a few months ago), the related feature doesn't have to be modified or removed everywhere else on this planet. In that case, it was only a preliminary injunction anyway (resulting from a fast-track proceeding), but what I just said would apply to a final ruling. Still, if a feature is unlawful in a given jurisdiction, Google must accept responsibility for the situation in that country. And in the particular case of the United States, the country in which Google is based and Android is published, Google has full responsibility. If the ban isn't stayed by the Federal Circuit, it will formally affect only HTC's products. Apple would have to sue other Android device makers separately to get to the same patent. It is asserting that patent against Motorola in a federal lawsuit but not yet against Samsung. And besides the big three Android device makers, there are countless others. HTC would have to pay the price for being the first one to be sued by Apple over that patent. If I were a US-based consumer, I would certainly take note of the fact that HTC lacks a feature that I, for my part, use quite frequently (though it doesn't work well for non-US phone numbers). Google publishes the related Android code under the Apache Software License 2.0. Its Section 8 contains a wholesale disclaimer of liability, but liability is not disclaimed if "required by applicable law (such as deliberate and grossly negligent acts)" (emphasis mine). After the ITC decision (and as evidenced by the statement Google gave to the Boston Globe), there cannot be any reasonable doubt about this being a case of deliberate infringement of a U.S. patent. Therefore, the downstream (device makers and app developers using the related code) could try to hold Google fully liable, arguing that willful patent infringement cannot be disclaimed. If a court found that it can be disclaimed, then Google doesn't have to pay, but it would irresponsibly expose to the risk of patent infringement liability anyone downloading and using or redistributing the infringing Android code, including app developers using the linkify library in their works. Willful infringement results in triple damages under U.S. patent law. It would make a lot of sense for Apple to sue Google at some point (maybe much later) on that basis over this patent. In any settlement negotiations, that could be another valuable bargaining chip. Violating Apple's intellectual property even after a formal ruling (by a quasi-judicial agency that makes things much harder for mobile patent holders than most other courts) is another way for Google to raise hackles at Apple. Additionally or alternatively to suing Google over this patent, Apple could also file an ITC complaint over just that one patent against, for example, a dozen Android device makers at the same time. I think Google should also think about the implications of this for the way it's perceived by the ITC -- the same ITC that Google seeks to lobby for weak remedies. In a formal sense, an ITC ruling against HTC only relates to HTC, as I explained. But its institutional raison d'être is to prevent market distortions resulting from unfair (in the sense of "infringing") imports from all companies. If the ITC holds a patent valid and infringed by Android but Google keeps publishing software (in the United States, in fact) that results in ever more infringing products being imported, Google effectively torpedoes the work that the ITC is doing. Google can't shrug off these serious issues merely by pointing to Android's "open source" nature (which is more than debatable as everyone in the industry knows). Open source licenses may not be amenable to the idea of restricting the availability of certain segments of the code to those jurisdicitons in which they haven't been declared unlawful. But most Android device makers enter into license agreements with Google -- otherwise there's no way they would be allowed to use the Android and Google trademarks. Under such licensing arrangements, Google already imposes a variety of restrictions on Android device makers as far as modifications to the Android codebase are concerned. In this context, Google could certainly ensure that, for example, a licensed Android OEM like HTC doesn't have to compete with dozens of other licensed ones who implement an unlawful feature only because they have not yet been formally hit by a ruling. Google has some explaining to do here. I have repeatedly criticized Google's attitude toward other companies' intellectual property (most recently in quotes I provided to the Christmas Eve edition of The Telegraph), but I want to be constructive. I have outlined the above criteria because I believe that all Android OEMs, app developers and users -- and many other entities and people -- have a right to know what Google is going to do now. This week's ITC decisions involving various of Apple's and Microsoft's patent infringement claims against Android were important, but every time the ITC rules on one of those smartphone patent cases, I am less surprised than before about the high drop-out rate of patent claims. That doesn't mean that those decisions don't matter. It's just that the ITC is ever less likely to become a forum that would singlehandeldy force, through its decisions, the relevant parties to settle their disputes. As an analyst I have to recognize new trends and digest information, and to adjust my positions accordingly. It's not just that I have to -- I thoroughly enjoy it. Almost 15 months back, I wrote an article on the role of the ITC as an increasingly popular patent enforcement agency, and I have linked to it on a number of occasions ever since. In principle, I still stand by the information in that article, but since then, I've seen a number of smartphone-related ITC positions (recommendations as well as preliminary and final decisions) that show it's a huge gamble for patent holders to take their claims there. It can be a fast avenue to favorable decisions, and that's really tempting, but at least in connection with smartphones, there's also a high risk of the ITC's actions creating a perception of some patents or patent portfolios being less powerful than they actually are. We'll still hear a lot from and about the ITC in 2012 (complaints, hearings, recommendations and decisions), but I wouldn't be surprised if some major patent holders now adjusted their litigation strategies and deemphasized ITC complaints in favor of actions in United States district courts as well as foreign courts. It's not just that it's hard for anyone to win there: it also takes longer. Apple's complaint against HTC was brought in March 2010 and finally adjudicated 21 months later. During that period, Apple could have completed two full subsequent rounds of litigation in Mannheim and Munich, and would only be a few months away from decisions on a third round. Also, a decision on an Eastman Kodak complaint against Apple and RIM, filed almost two years ago, just got pushed off by nine months. And when the ITC opens new investigations, it recently set 18-month target dates from the beginning, counting from the launch of the investigation (about one month after the complaint) and likely being subject to further delays. If I were a conspiracy theorist, I could think of a many possible explanations. For example, with the ITC clearly aching under its huge caseload, one might speculate whether it actually hopes plaintiffs-to-be recognize that all their lawsuits slow down the process, hoping that this -- rather than more taxpayers' money for the agency -- will ultimately redress the balance between supply and demand. But let's be deferential to the ITC, which has an important task, and focus on the hard facts here. One of the hard facts is also that fending off an ITC complaint in whole or in large parts still takes hard work. None of this is meant to diminish the defensive achievements of the respective defendants. Let there be no doubt: HTC and Motorola have reasons to be proud of the work they've done, and happy about the fact that they've contained the damage for the most part -- and for now. Their disputes are far from over, but things could have been much worse for them. That said, at the ITC it's undoubtedly the complainants who face an uphill battle, and the level of expectation of independent observers is rather low now. Maybe it wouldn't have been easier to win at the ITC in previous years. But the rate of settlements is conspicuously low in connection with smartphone patent disputes, so there are more decisions relative to the number of compaints, and those decisions don't serve to facilitate settlements. November 2010: the ITC staff, which acts as a third party to some proceedings (for a lack of resources, no longer to all of them), says Nokia isn't liable for infringement of any of five patents asserted by Apple in investigation no. 337-TA-704 (these are the patents that Apple asserted against Nokia but not simultaneously against HTC). January 2011: in investigation no. 337-TA-703, then-chief ALJ Paul Luckern finds no violation of a key Eastman Kodak patent on digital imaging by Apple and RIM. 13 months earlier, a different ALJ had made an initial determination that held Samsung and LG (which settled at about that time) to infringe that patent. March 2011: an ALJ makes an initial determination that Apple doesn't infringe any of five Nokia patents asserted in investigation no. 337-TA-701. Nokia had previously dropped two patents voluntarily. April 2011: in investigation no. 337-TA-710 the ITC staff sees no violation of five Apple patents by Nokia and HTC (Apple had previously dropped five patents voluntarily from that investigation). July 2011: an ALJ believes Apple infringes two S3 Graphics patents (out of four asserted ones). Those two patents are closely related to each other, which makes it more like a potential win on several claims from the same patent. Shortly thereafter HTC announces the acquisition of S3G. The companies had a major shareholder in common. But it turns out that Apple's core products aren't suspected of infringement, and in November 2011, the ITC concludes a review with the complete dismissal of the complaint. July 2011: the ALJ in charge of investigation no. 337-TA-710 makes an initial determination that HTC infringes on two of Apple's ten originally asserted patents. But this determination is reviewed, and this week one of those two patents was found infringed and the other was not (or it was considered invalid). October 2011: an ALJ recommends the dismissal of HTC's first ITC complaint against Apple (four patents in play, one previously dropped by HTC). In December 2011, the Commission announces a review limited to only one of those patents, and even on that one an HTC win does not appear too likely. December 2011: as I mentioned before, a final ITC ruling (investigation no. 337-TA-710) finds HTC to infringe two claims of one Apple patent, and a day later, an initial determination (investigation no. 337-TA-744) finds four claims of a Microsoft patent to be infringed by Motorola's Android products. The defendants announce workarounds. I think the situation between Nokia and Apple was an interesting one. Both companies were heading toward a "goalless draw" (though Nokia still had some hopes that a review of the initial determination might improve the outcome). The ITC, which has the job of protecting the domestic industry against unfair competition from imported products, didn't make things easier for the U.S. company than for its Finnish competitor. Both parties' claims got a rough ride. The ITC can uphold and protect intellectual property in connection with smartphones since those devices are all manufactured outside the United States, even if their makers (like Apple and Motorola) are based in the US. At any rate, the dispute between Apple and Nokia is a good example of the ITC being a consistently difficult forum for all patent holders rather than pursuing a protectionist agenda. It has certain policies and all the time stakeholders try to sway the ITC on non-legal or pseudo-legal political grounds, but it doesn't disadvantage foreign companies. For example, Samsung doesn't have to be afraid of the ITC playing favorites with Apple. That dispute is taking place in ten countries and in the end neither litigation in the U.S. nor in South Korea (Samsung's home country) is likely to decide the overall outcome. That one will likely depend in no small part on jurisdictions like Germany, France and Australia, or any other of the ten countries in which they're suing each other. In general, I like it when courts or quasi-judicial agencies set a reasonably high bar for patent infringement claims to succeed. On this blog I have repeatedly criticized judicial decisions that set the bar too low. The ITC may set it too high, considering that its primary task is the effective protection of intellectual property. But if we all look back at the ITC's role in a year or so, we may once again see the same consistent pattern that I just discussed -- possibly with adjustments where the merits of certain cases warrant it, but the ITC is probably going to continue to dismiss the vast majority of smartphone patent claims brought before it. District courts and similar courts in other countries are in a different position. After they rule, stakeholders can ask for changes to the law, but they can't ask political decision makers to overrule. With the ITC, which is a government agency, there are political challenges, somewhat similar to the ones that antitrust regulators also face all the time. Any recommendation of an import ban is subject to a Presidential Review. While U.S. presidents frequently delegate this to the U.S. Trade Representative, and even before the first smartphone-related import ban was handed down, leading U.S. carrier Verizon asked President Obama to veto any bans. Verizon knows there are many cases pending in U.S. district courts, and there will be injunctions by such courts at some point, but its political call related only to the ITC. And as I explained, the ITC's decisions don't provide the slightest indication of any such thing as protectionism (if one wanted to accuse them of anything, it would have to be the opposite), but if foreign nations thought their companies are treated unfairly, they would likely complain through diplomatic channels and their impressions could influence their own trade and IP enforcement policies. In light of that, it's often the safest and easiest bet for the ITC to take skeptical positions on patent claims (though that also had political repercussions in connection with the Kodak case). I guess the ITC really hopes to avoid that it orders an import ban on a patent that might be invalidated shortly thereafter. There isn't going to be much of a public debate over whether the ITC has recently struck the right balance. That's outside of my focus, too. But I do take note of its decisions, and just the ones I listed above involve a number of major players and dozens of patents, and chances are that those complaints would have been considerably more successful in district courts and definitely in certain international courts. Today the Munich I Regional Court held two hearings on lawsuits brought by Apple against Motorola in Germany. Motorola extended this dispute to Germany with four complaints filed on April 1, 2011 in Mannheim (about six months after its first U.S. lawsuit against Apple), provoking several lawsuits from Apple in Munich. The ongoing smartphone patent war continues to be a war of attrition in which no decisive "knockout" blow is likely in the very near term, but Apple is making ever more progress forcing its competitors to modify their products in order to work around some of Apple's original ideas, which is what Steve Jobs wanted them to do. One of the next "trophies" in this regard may very well be handed to Apple by the Munich I Regional Court on February 16 in the form of an injunction against Motorola products that implement a certain method for flipping pages in a photo gallery in a way the court may find to infringe on EP2059868 (EP = European Patent). The court doesn't have much doubt about the validity of this patent and appears rather convinced (at the end of the hearing even more so than at its outset) that the Android photo gallery constitutes a violation of that patent at least in its "zoom in" mode and possibly (though this is not yet certain) in its "zoom out" mode. To be clear, I didn't quite get the impression that the prospect of this kind of injunction scares Motorola to death. Motorola is defending itself professionally but there are no signs of panic. After all, Samsung has already worked around that same patent to skirt a preliminary injunction ordered by a Dutch court in August. But if Motorola didn't care at all, it wouldn't have implemented that patented technique in the first place and this particular lawsuit would never have happened. While one or two wins of this kind won't be enough to change consumer preferences, the aggregate effect of the enforcement of half a dozen or more patents of this kind could make an appreciable difference in user experience. And from a mid-term to long-term point of view, any such patent has more competitive impact than design-related rights. I heard that two design-related court hearings in Düsseldorf this week didn't go well for Apple, with the Galaxy Tab 10.1N, a modified version for the German market against which Apple brought another lawsuit) likely being sufficient to work around an existing preliminary injunction and an appeals court apparently being inclined to interpret the scope of Apple's tablet computer design right more narrowly, which would favor Samsung (and also Motorola, which Apple is suing in Düsseldorf over the design of the Xoom tablet). Apple is fighting for long-term opportunities. As long as it doesn't come under enormous pressure, it can afford to crack one nut at a time, country by country. In this you-win-some-you-lose-some game, a substantial drop-out rate is less important than steady progress. A high hit rate is of course desirable, and the extent to which Motorola, Samsung and HTC defend themselves successfully is nothing short of impressive, but if the hit rate isn't extremely high, it just means that it takes a patent holder more time and money (both of which is not an issue relative to what's at stake) to get to a certain level of success. With a large and rapidly-growing portfolio, bringing larger numbers of parallel patent assertions in ever more jurisdictions is a justifiable and easily affordable way of compensating for a limited hit rate. Also, the hit rate that patent holders achieve appears to be significantly higher in most other jurisdictions than at the ITC. Every single patent like the one on flipping pages in a photo gallery can contribute to differentiation and help avoid commoditization. In some cases, users wouldn't ever talk about the difference between a workaround for a patent and the patented method, but several such differences could still have a subconscious effect and make one platform appear more user-friendly and more fun to use than the other. In other news from today's doubleheader in Munich, Judge Peter Guntz indicated an inclination to stay another litigation. In that one, Apple is asserting its well-known slide-to-unlock patent, for the duration of a parallel nullity (invalidation) proceeding. A stay is not a given, and the court is weighing at least two other options. The fact that a Dutch judge recently considered that patent invalid, finding on a preliminary basis that it appears obvious over a combination of two pieces of prior art, appears to bear significant weight with the Munich court. Doubts over the validity of the asserted patent could delay the case considerably, but it would actually be a better outcome for Apple than the inclination the Mannheim Regional Court indicated last week in a case in which Apple is asserting that patent against Samsung. Mannheim is reluctant to stay patent lawsuits on the grounds of suspected obviousness of a patent over prior art, which would be useful to Apple in this case, but last week, at a hearing on an Apple lawsuit against Samsung, Mannheim-based Judge Andreas Voß appeared inclined to interpret the patent more narrowly than his Munich-based colleague today. Motorola and Samsung have different slide-to-unlock implementations (in fact, each company has at least three implementations all by itself), so the infringement analysis isn't directly comparable, but I heard both courts' views on how to interpret the patent claims and Munich's take is more inclusive. It wouldn't be unusual for two German regional courts to interpret the same patent claim slightly differently. Reasonable people can disagree on this. Neither court can set binding precedent for the other by being first to rule, but there would certainly be a risk for Apple that if the Munich case gets stayed for as long as validity is being sorted out, the Mannheim case could be decided against Apple on the infringement side. Apple would most likely appeal such a ruling, and the Karlsruhe Higher Regional Court still couldn't set binding precedent for the Munich court (apart from precedent having less weight in Germany, those courts would be in different circuits anyway), but if the appeal went well (and quickly enough) for Apple, it would have major persuasive impact in Munich. The broadest possible interpretation that Judge Guntz might (or might not) give this patent -- and which may or may not be the right one -- would make it rather difficult to work around without a substantial degradation of the user experience. A moderately broad interpretation would still leave room for non-infringing alternatives offering a substantially similar user experience. A quick win in Germany on this patent is not very likely (though not impossible). If I were Apple, I would fight for a broad interpretation even if it takes time. No one knows how long Apple's disputes with Samsung and Motorola will last. But even if they settled with those two players somewhere along the way, there would still be countless other Android device makers out there, and the scope of that patent needs to be clarified by appeals courts at some point. In the meantime, various other patent infringement claims can (and probably will) be brought and adjudicated.